Metaphors are used commonly in NLP in order to enable the NLP trainer or NLP practitioner to make connection with the clients unconscious mind. The benefit of doing this is that it connects them with the source of all the clients learning and behaviour, thus enabling them to change rapidly. 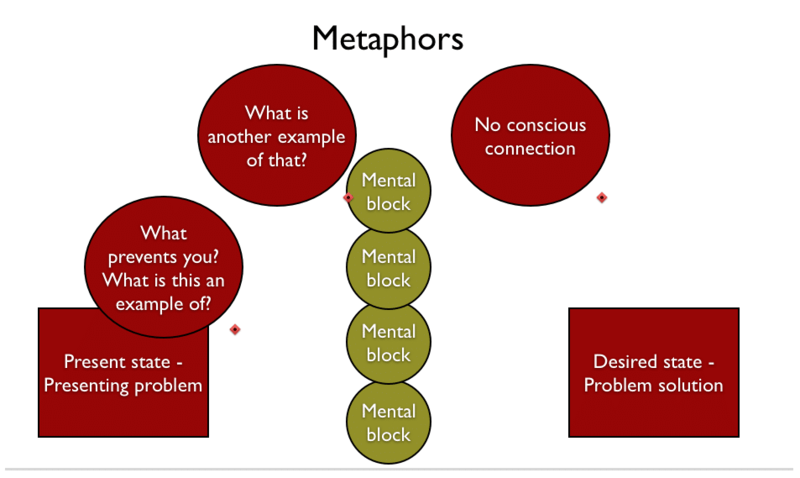 There are several types of metaphor used in NLP, shallow metaphors, deep metaphors, and embedded metaphors. Shallow, Simple metaphor – comparison, simile. A story with different levels of meaning. Embedded metaphors are several metaphors linked together (like Ronnie Corbett frequently used in the Two Ronnies). The idea is that the conscious mind of the client is confused as the stories appear to make no sense, thus allowing the trainer to get access to unconscious resources and make suggestions to improve learning or healing. A shallow metaphor makes simple comparisons and creates a better understanding, a deep metaphor has stories with many different levels of meaning and is typically most useful when a client is in trance in order to communicate with the unconscious mind. To gain understanding at the unconscious level. Assess the strategy of the client – the sequence of the representations creating the behaviour. Identify and determine the desired new outcomes and choices – present state to desired state. Establish anchors for strategic elements involved in this current behaviour and the desired outcome. Create or think of a logical, smooth story. Choose an appropriate context for the story. Establish a relationship between the clients situation and behaviour, and the situation and behaviours of the characters in the story. Access and establish new choices and resources for the client in terms of the characters and events in the story. Use ambiguities, direct quotes and other language patterns. Collapse the pre-established anchors and provide a future pace. Can help clients to better understand something about the object or idea to which the metaphor is applied. Can make speaking, and writing more lively and interesting. Can communicate a great deal of meaning with just a word or phrase. Can create a mind shift since they imply rather than directly state relationships, can get clients to think about what they are hearing and take on new learnings. Here is an example of a deep metaphor. Metaphors form part of the NLP Language Patterns section of our NLP Training Courses. Learn more now by visiting our NLP e-Learning pages.